Conversation Hearts are the quintessential Valentine’s Day candy. Not because they are good (does anyone else think they taste like chalk?). But because somehow a long time ago we fell in love with those cheesy, abridged phrases printed on colorful sugar hearts. Which is why I love making them into cookies for Valentine’s Day (this isn’t the first time I have done so!). Because 1) I can make something that actually tastes good, and 2) I can pick my own cheesy phrases to write on top. 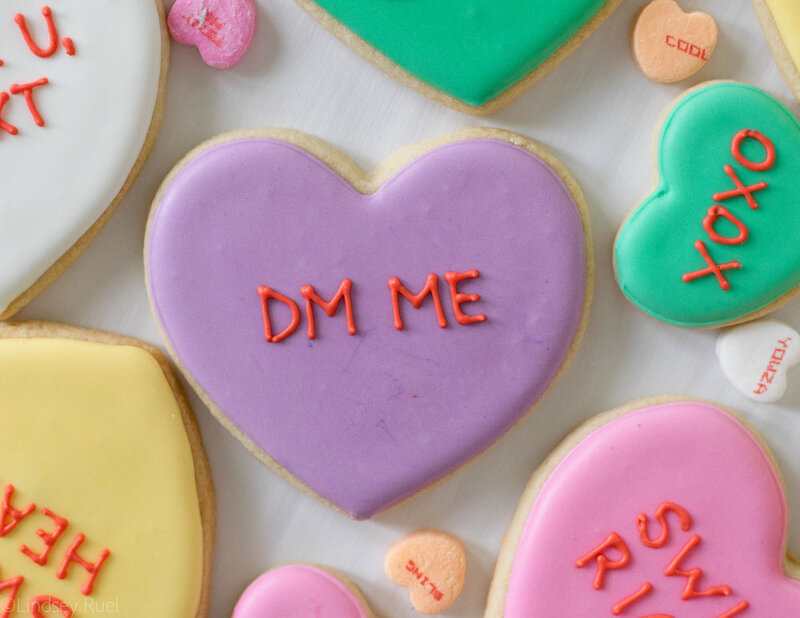 I decided that these Conversation Heart cookies needed a bit of an update in the cheesy saying department. Which is why I wrote thing like, “DM me”, “Netflix and Chill”, and “Swipe Right”. And I only know what about 50% of them mean. Start with some heart shaped sugar cookies and a batch of royal icing. These cookies are pretty simple to decorate. Outline the cookie in icing, then flood the cookie with the icing and let it dry. Once dry, write whatever you want on top with red or pink icing. What is a bit more tricky is mixing the colors so that they match the conversation hearts candy! Fortunately, I did the hard work for you so you can quickly mix up a batch of your own icing. For each color, I started with about 1/2 cup of plain icing then added the color. I added one drop of color at a time until I got the right shade and color. In some cases, I only needed a little bit of a color and used a toothpick to add a small amount, or a “dab”. For all the colors of icing I just mixed flood consistency. That is icing that will settle back into a flat surface in 10-15 seconds (I tend to go towards 15 seconds when I am using it to outline and fill). Then for the writing on top I used piping consistency (settles back into a flat-ish surface in about 30 seconds, but may have some bumps) and colored it with red food coloring. However, you could also use a red food marker instead. I hope you make these for your loved ones this Valentine’s Day! Make sure to tag me on Instagram (@lindsey.ruel) if you do!